Emma DiCarlo first appears at Fairport Harbor, Lake County, Ohio, in 1935. Her mother, Rosa Roa, immigrated to the United States in 1935, with Emma. They were joining the family’s father, Sabastiano DiCarlo, in America. 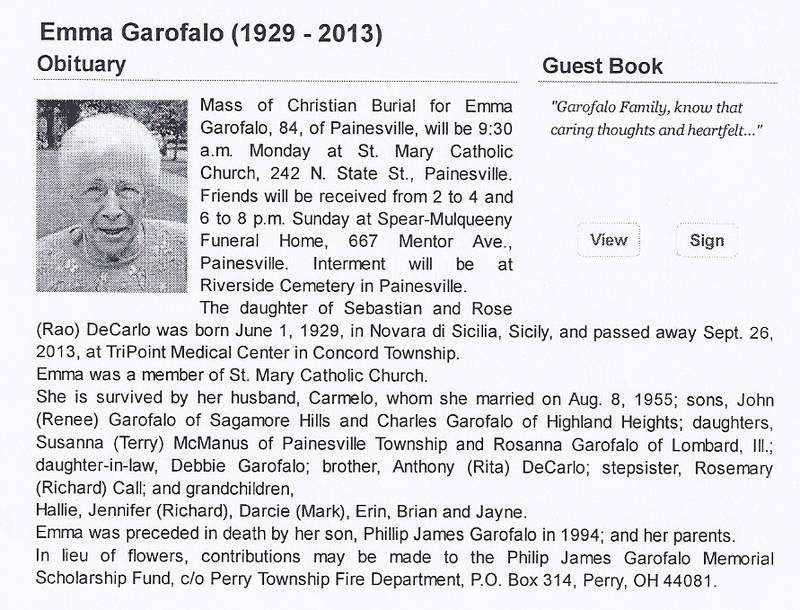 In America, Emma DiCarlo was known Emma DiCarlo, then after she married, Emma Garofalo. Emma DiCarlo, daughter of Sabastiano DiCarlo and Rosa Rao, was born on Saturday, June 1, 1929, at Novara di Sicilia. Emma married Carmelo Garofalo, son of Filippo Garofalo and Antonina Milici, on August 8, 1955, at Madre Chuesa, Novara di Sicilia. Emma died on September 26, 2013, at TriPoint Medical Center, Concord Township, Lake County, Ohio, at age 84. Her body was interred at Riverside Cemetery at Painesville, Lake County, Ohio. Emma DiCarlo immigrated to the United States on January 31, 1935, at age 5, travelling to Painesville, Lake County, Ohio. 4. Philip James Garofalo. Philip James died in 1994. 5. Rosanna Garofalo was born about 1958. Rosanna died on March 17, 2015, at her sister’s home, Painesville Township, Lake County, Ohio. Her body was interred at Perry Cemetery at Perry, Lake County, Ohio.